Description: - Take a wondrous walk through this enchanted garden of peach roses, pink lilies and purple daisies. 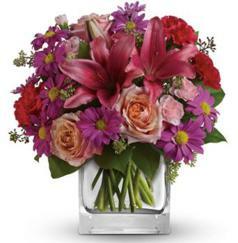 Delivery: Brisbane Flower Delivery offers Free Delivery to almost all locations across Queensland. Our Brisbane florist network delivers flowers by allocating your order to a florist located close to your recipients destination. An email confirmation is sent to you on placement of your order. Just "Add to Cart" the items you want and proceed through our secured checkout.